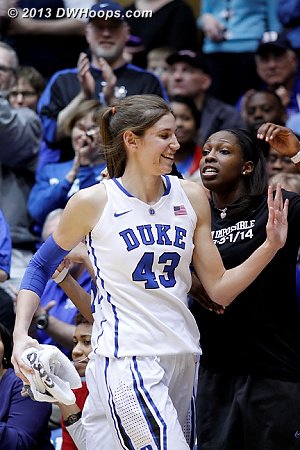 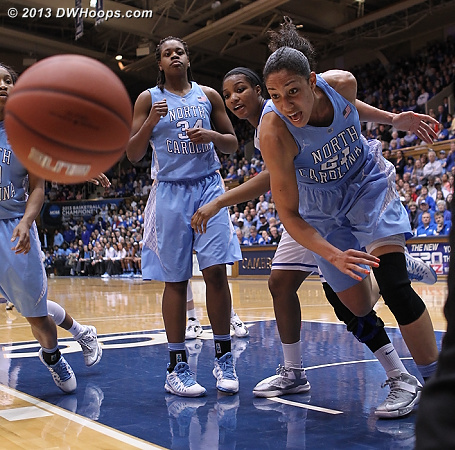 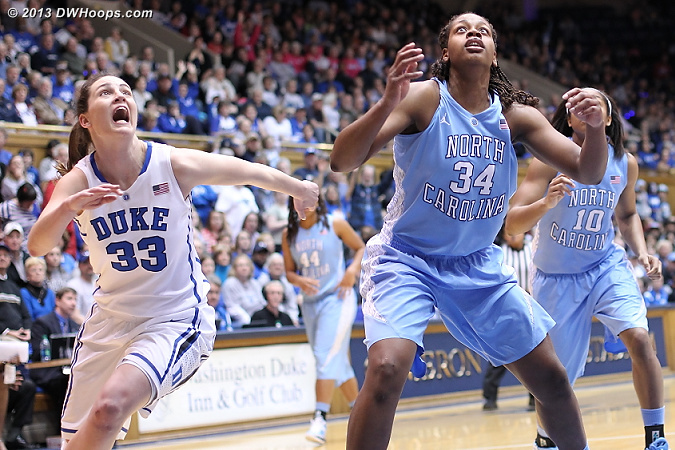 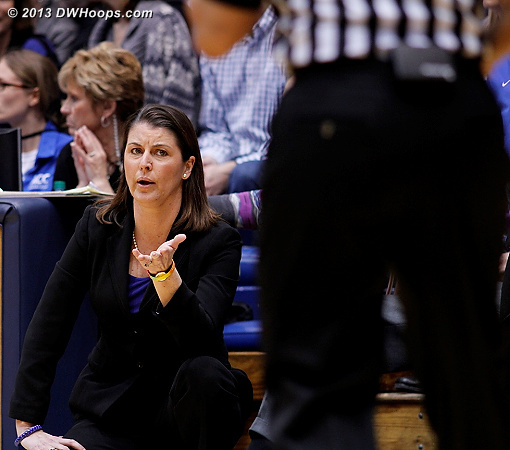 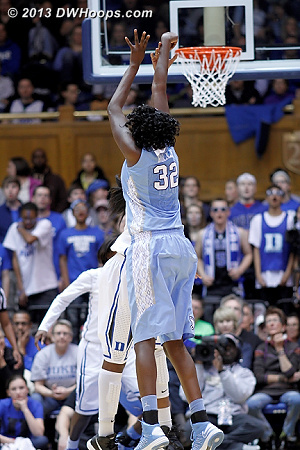 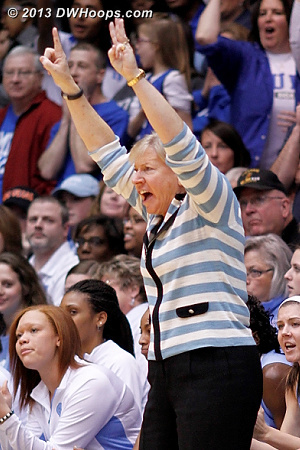 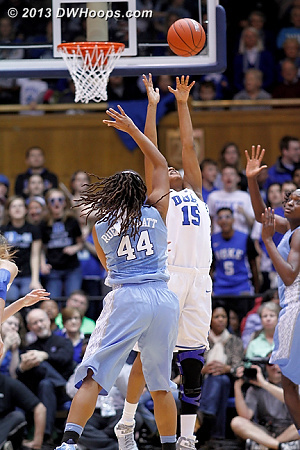 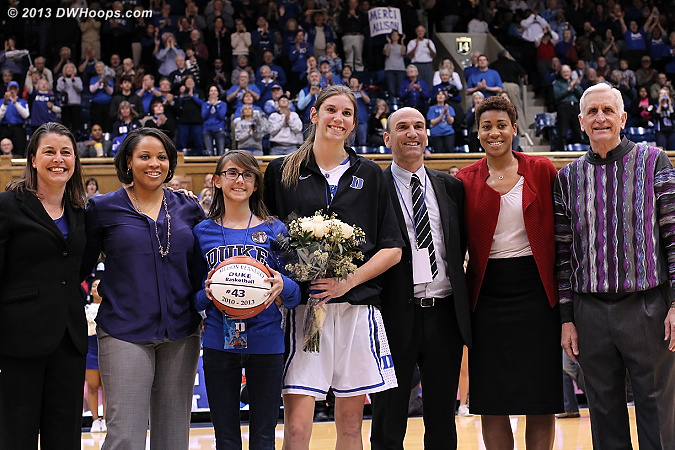 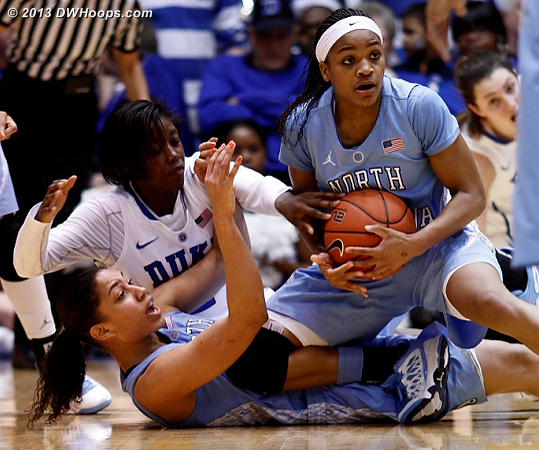 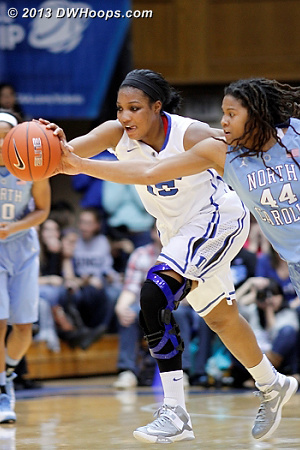 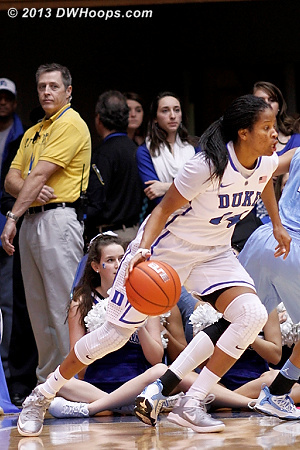 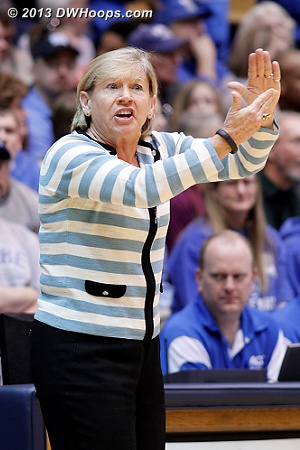 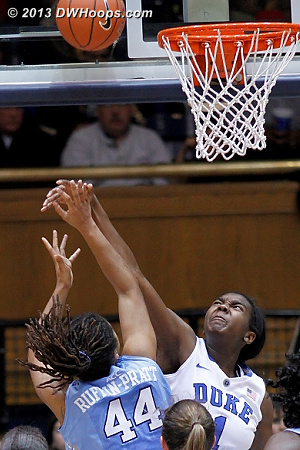 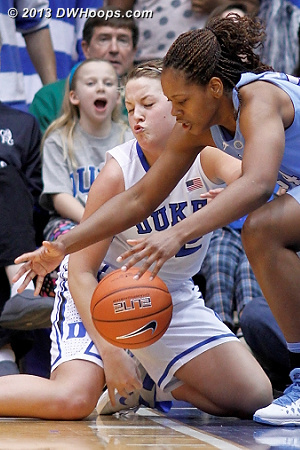 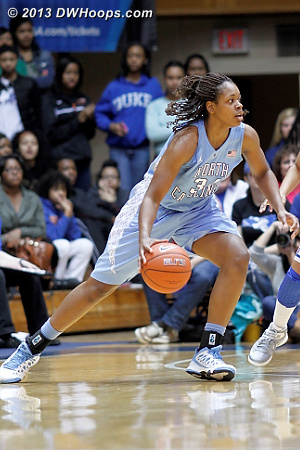 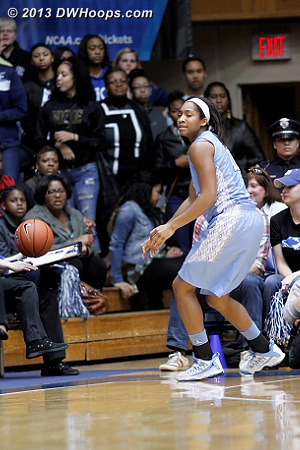 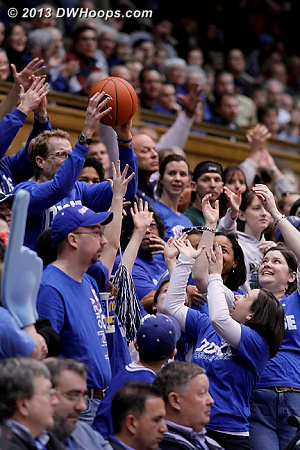 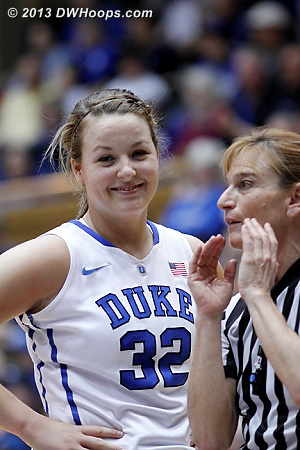 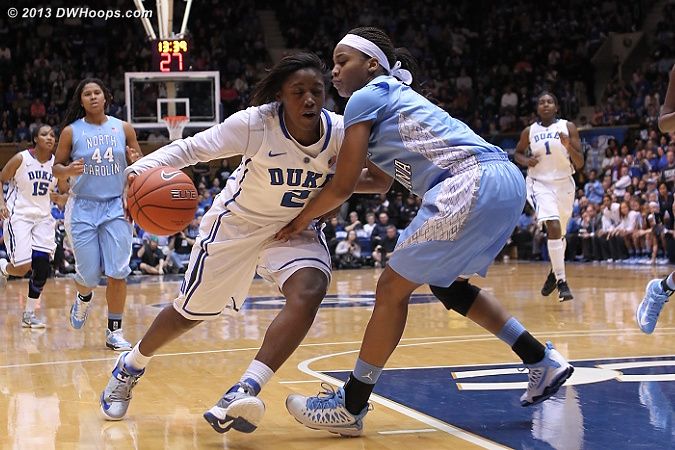 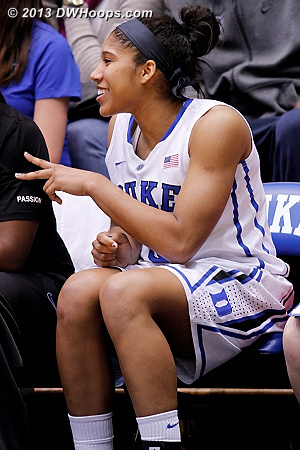 Our DWHoops captioned photo gallery tells the story of Duke's 65-58 Senior Day win over UNC. 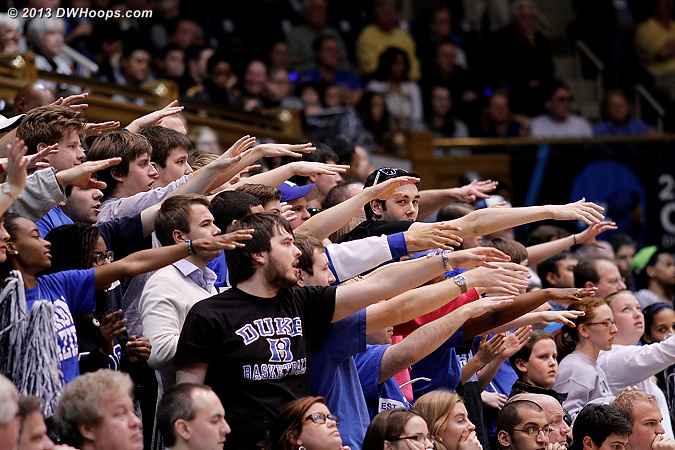 As usual, additional photos are available to our site members. 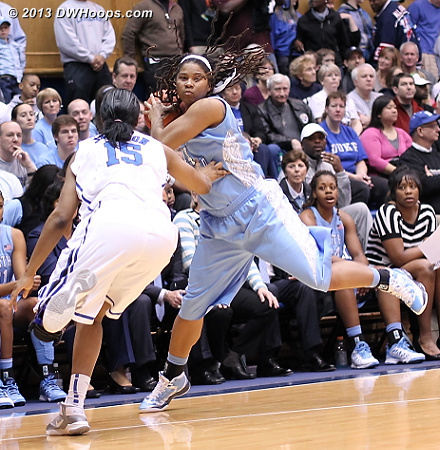 At this time game photos are done, but press conference photos with quotes will be added later. 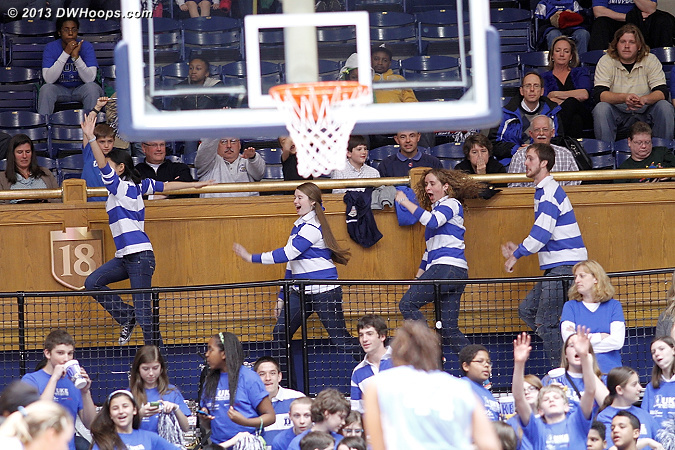 Also, a gallery of Duke cutting down the nets in celebration of the 2013 ACC Regular Season Championship will be published separately, later. 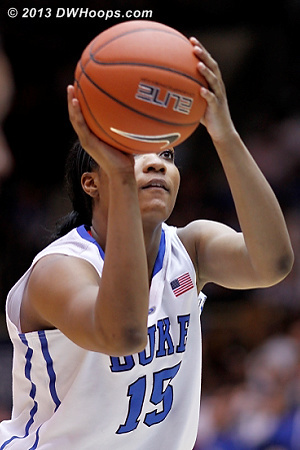 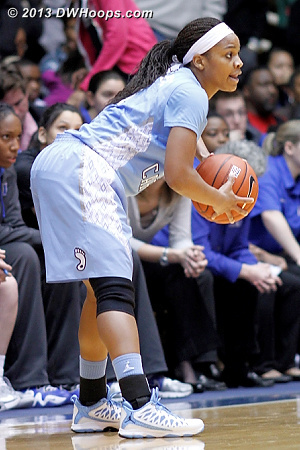 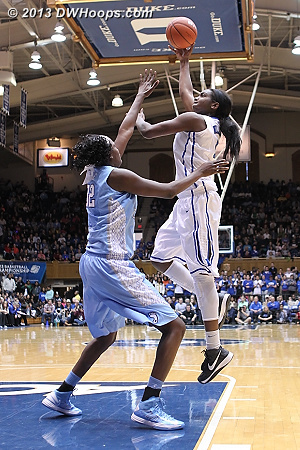 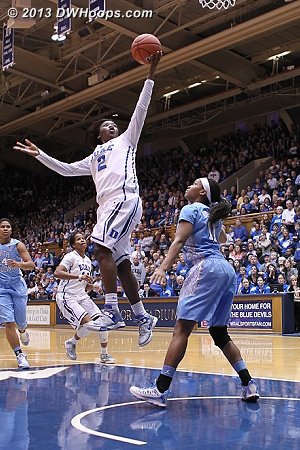 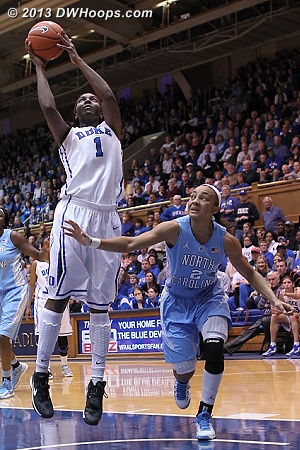 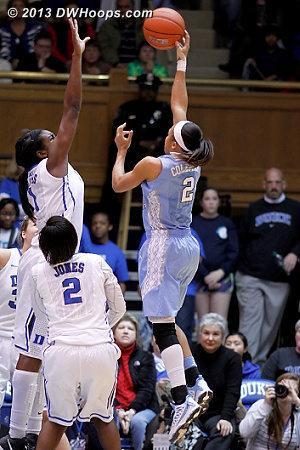 Alexis Jones sunk this circus shot after drawing foul #3 from Rolle. 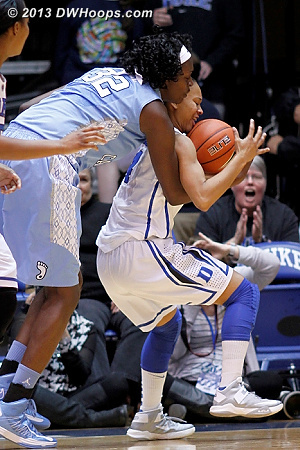 Bedlam, 16-10 Duke, time out UNC. 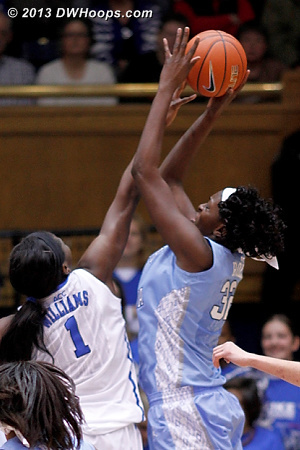 TRP barrels through a Peters screen a second time on this possession. 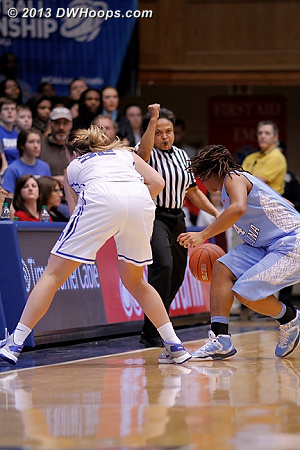 In a Dee Kantner called game, if no advantage is gained and no harm is done, this is allowed. 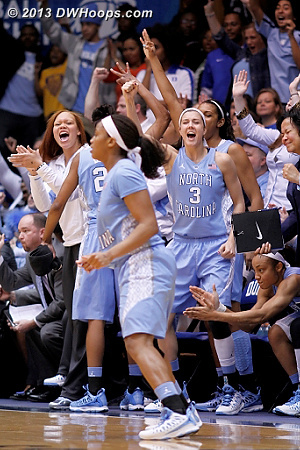 Tar Heel bench erupts after Rountree's three in transition puts UNC up 32-26. 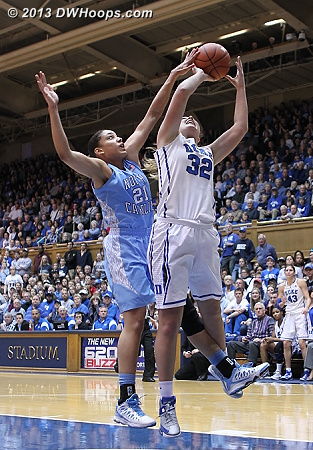 The next 19 (yes, 19) Carolina shots would miss. 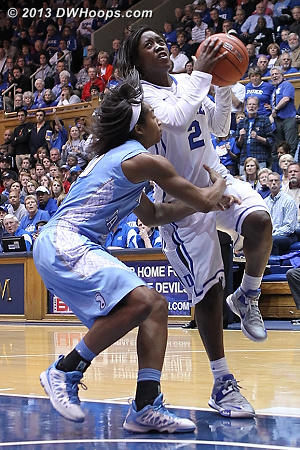 After the initial second half make Rountree would miss six threes, some of them taken from far beyond the arc for no apparent reason. 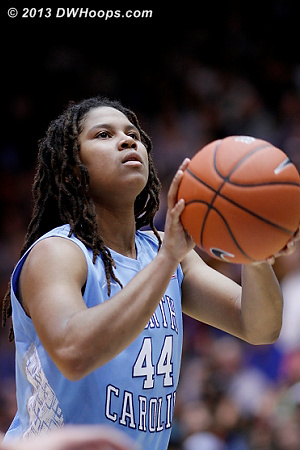 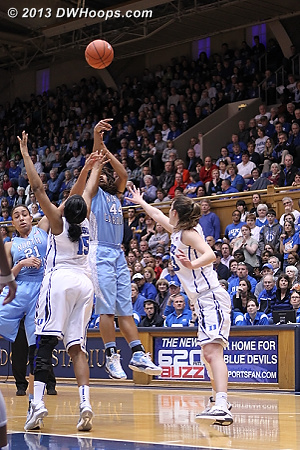 Vernerey goes right-handed to cut UNC's lead to 32-30. 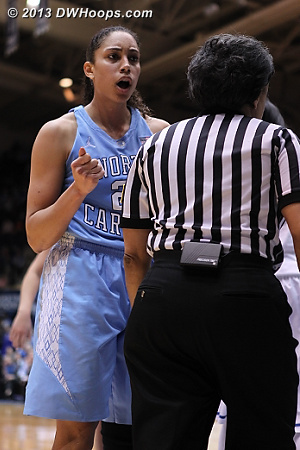 Where has that been?!! 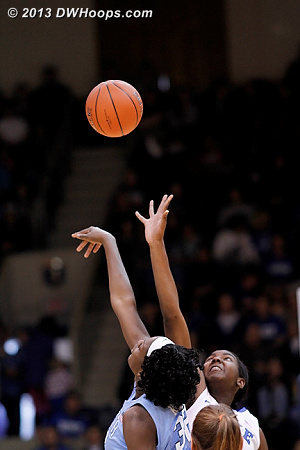 After the whistle had blown on the held ball, Brittany Rountree was third player in, felling Vernerey with a shot above the shoulders. 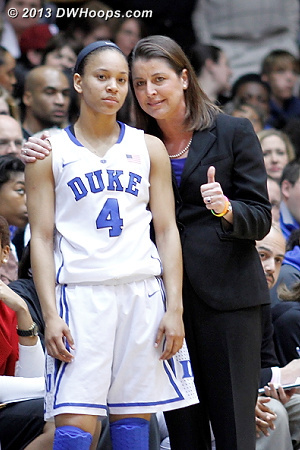 Elizabeth Williams obviously horrified by the scene. 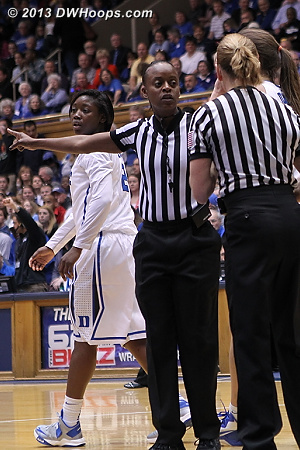 Dee heads to the scorers table to review the play. 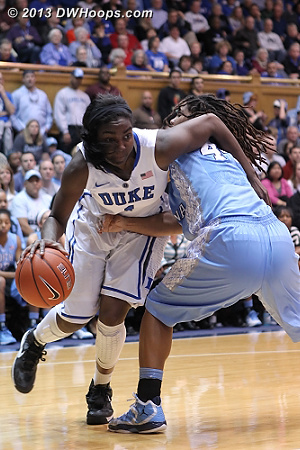 A dead ball contact technical was assessed to Rountree, sending Liston to the line for two. 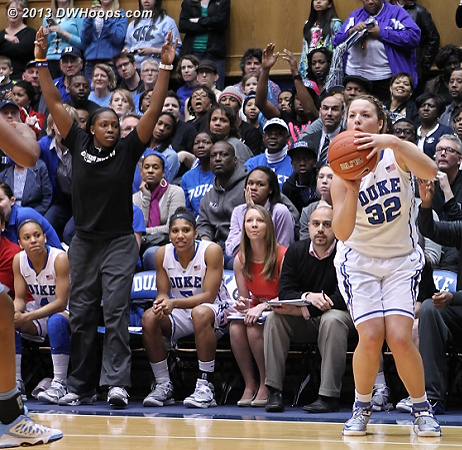 All alone, Liston hit the second, her first points of the game. 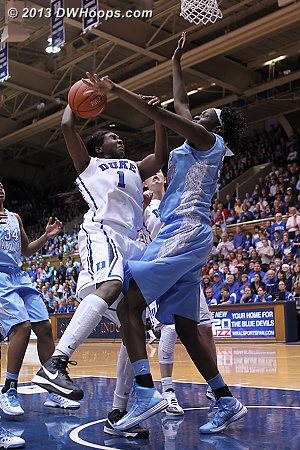 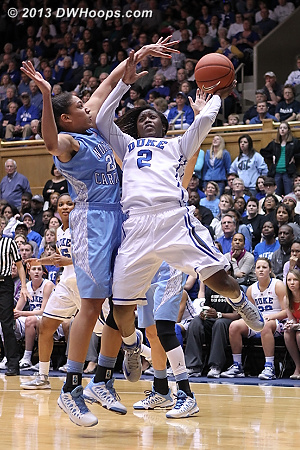 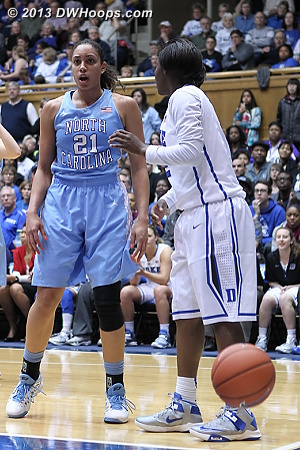 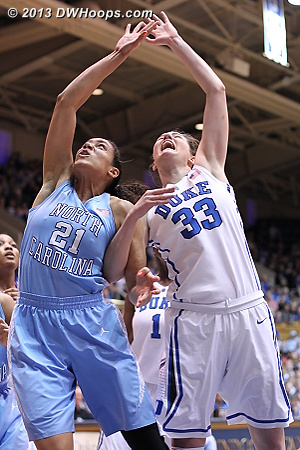 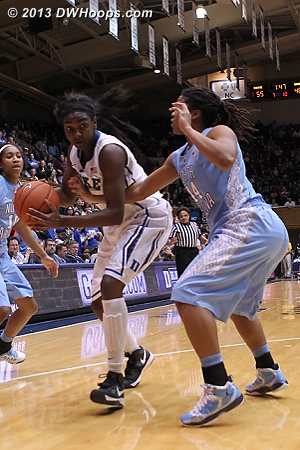 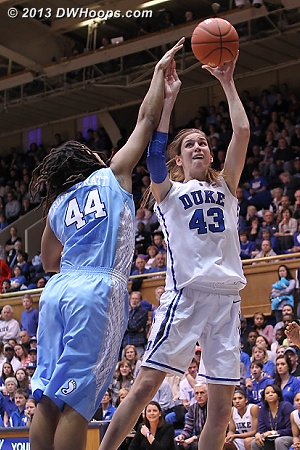 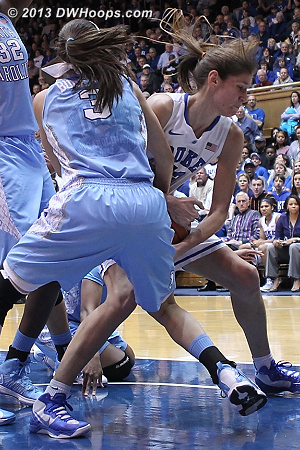 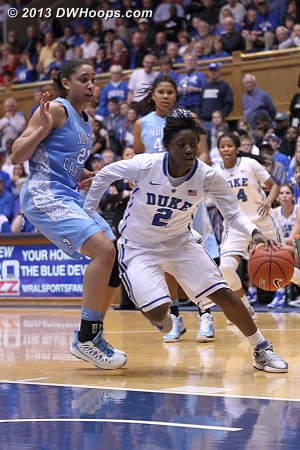 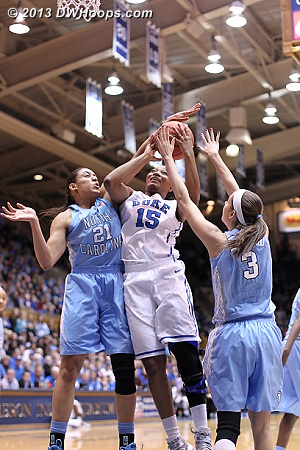 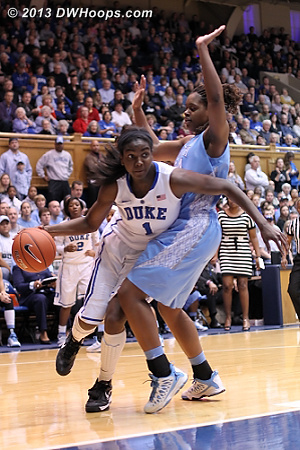 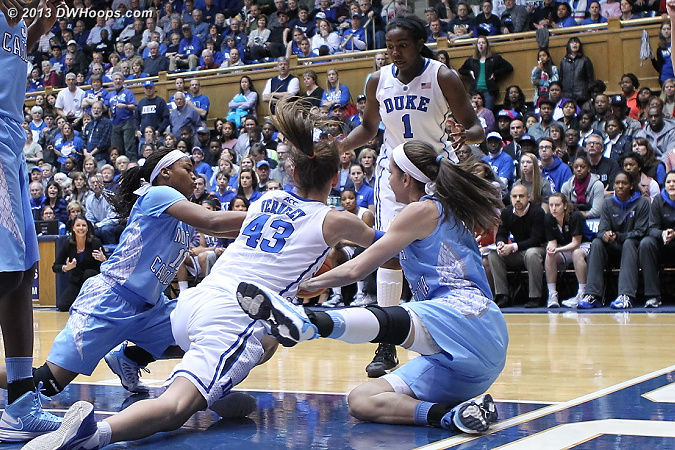 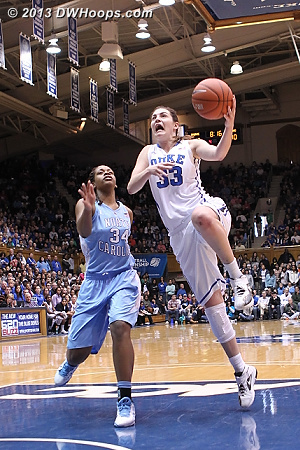 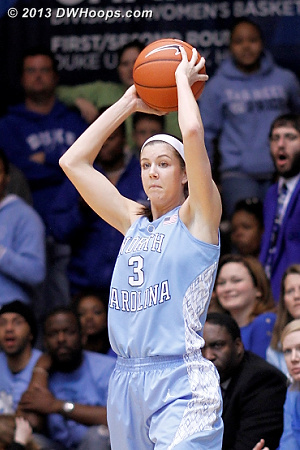 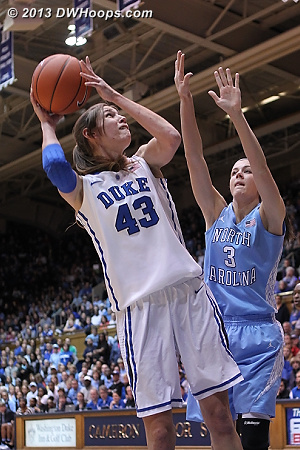 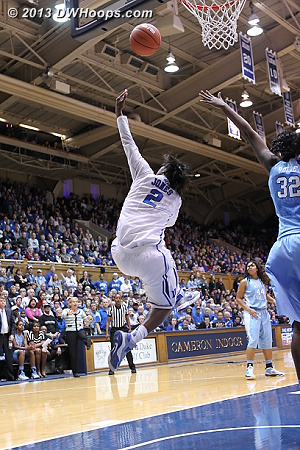 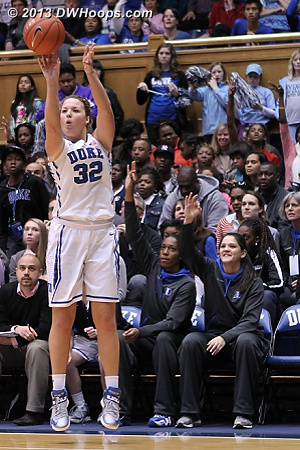 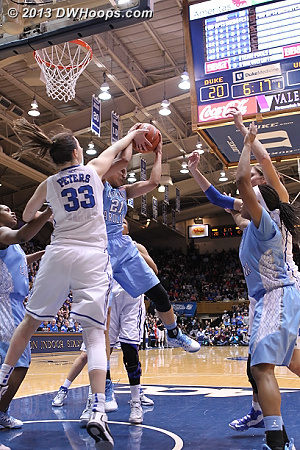 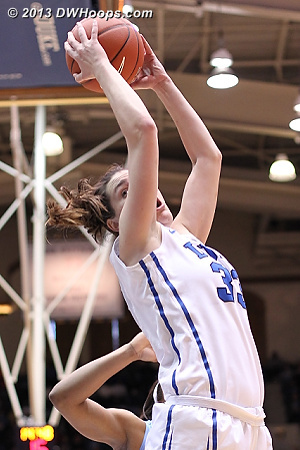 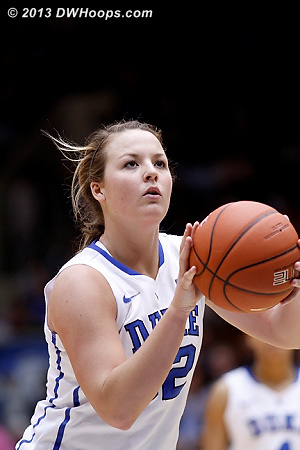 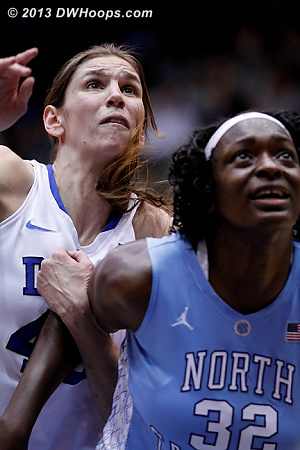 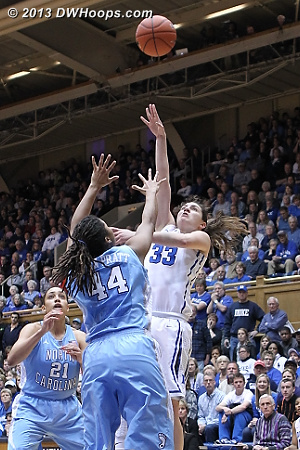 Krista Gross screens two Duke players at once! 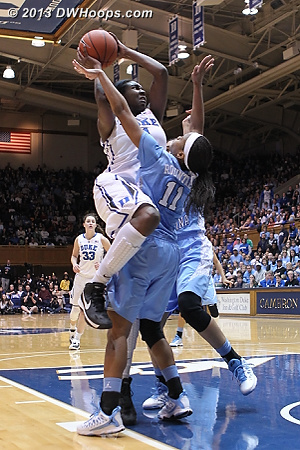 But this one they had to call, and counting the contact technical, it was Rountree's fourth. 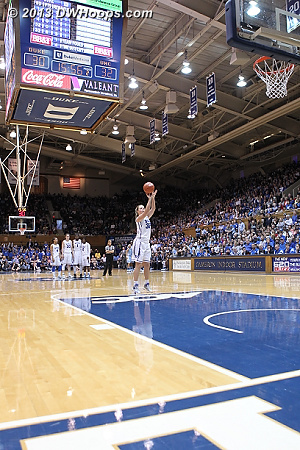 Jones' free throws gave Duke the lead. 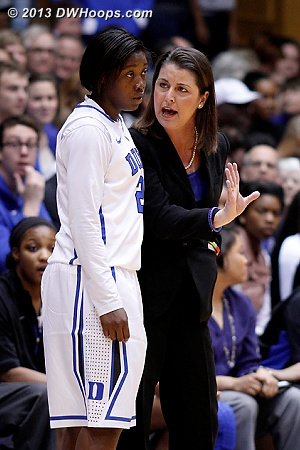 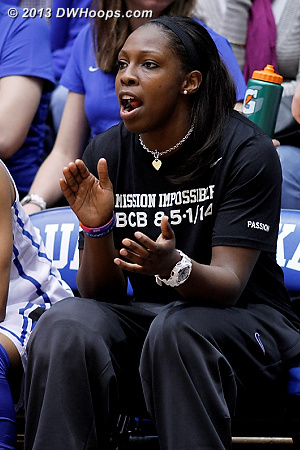 Chelsea Gray working hard on the Duke bench, described by Alexis Jones as "like a big sister"
Coach P gets the explanation that it was deemed an offensive foul on TRP, and Duke would get no free throws. 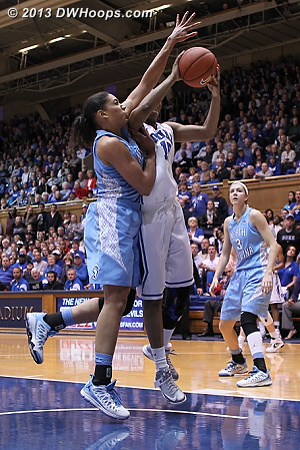 Gross did not get credit for a blocked shot here, but should have. 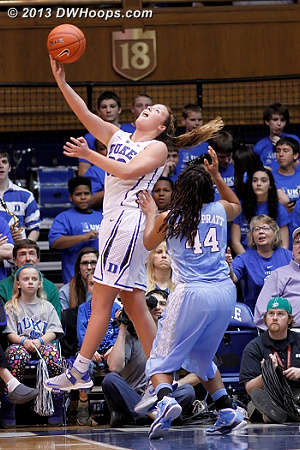 In general Duke official scorers seemed somewhat stingy on awarding blocked shots this season. 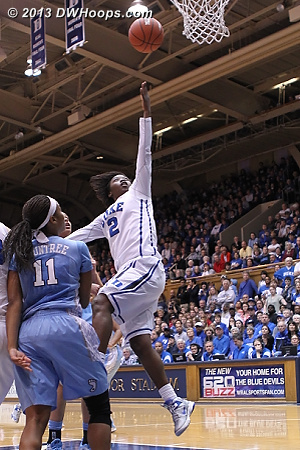 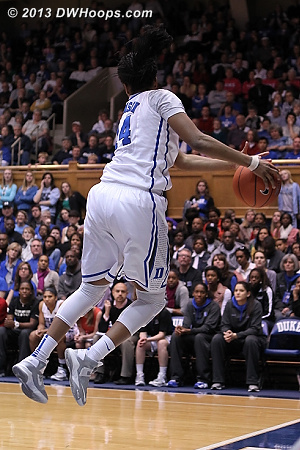 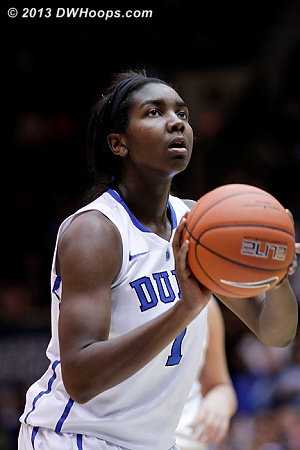 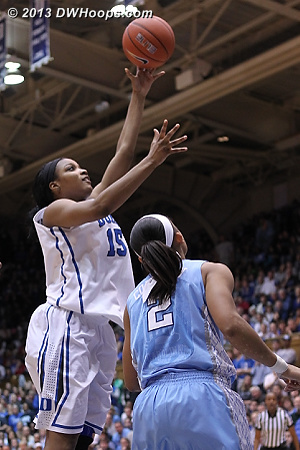 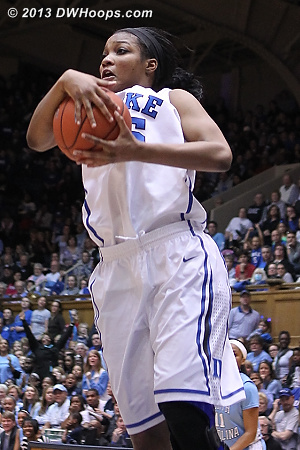 Jones goes coast-to-coast, Duke double digit lead, time out Heels. 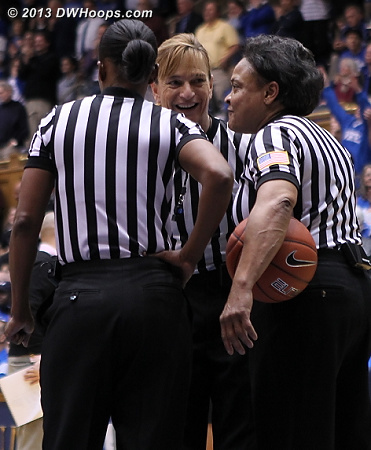 Dee Kantner (center) huddles with Denise Brooks (left) and Bonita Spence. 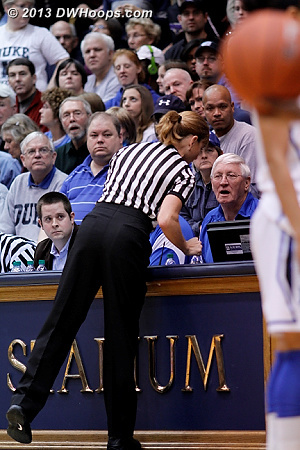 Three veteran officials. 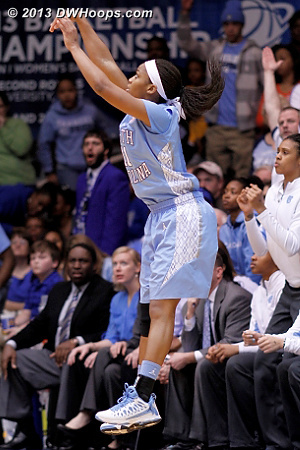 Xylina McDaniel threw a pass to this lucky fan. 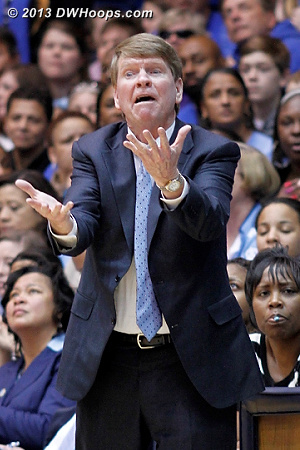 Sorry sir, you'll have to wait for Durham Bulls season for a souvenir. 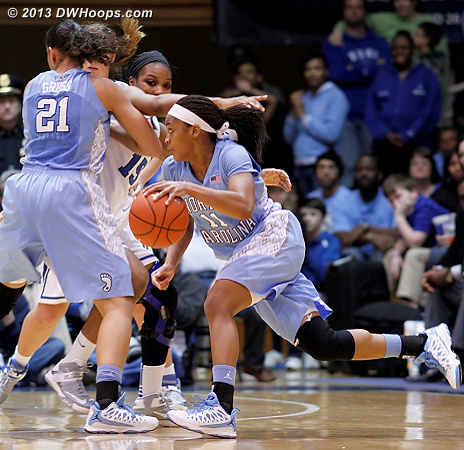 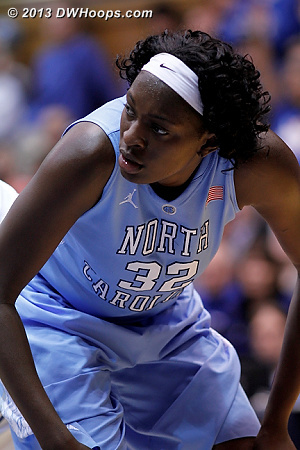 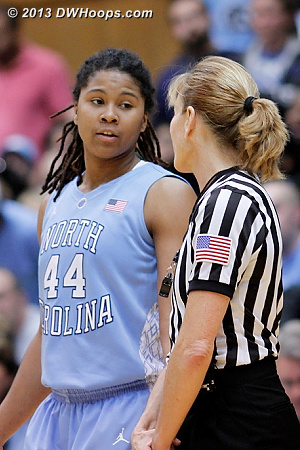 After Chloe Wells ripped the ball out of Waltiea Rolle's arms, Rolle reached in to commit her fifth foul. 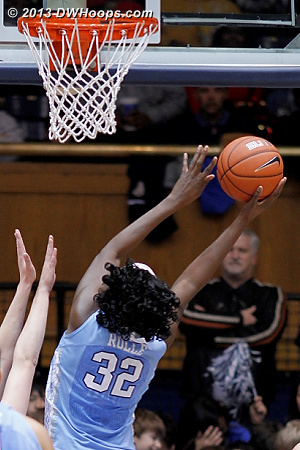 9 points, 6 boards, and just 21 minutes for Rolle. 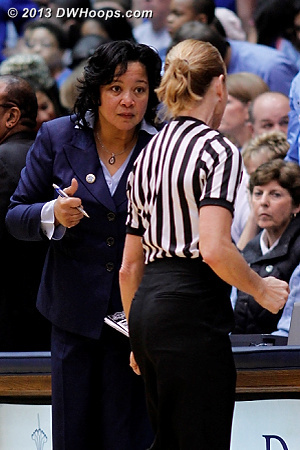 I wonder if Dee was explaining to Tricia how it's acceptable for players from either team to ride their opponents up and down the court like a hobby horse. 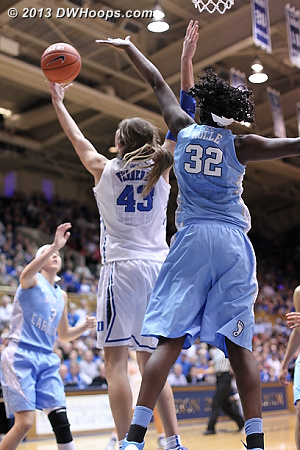 As a junior, Tricia should already know how these games are called. 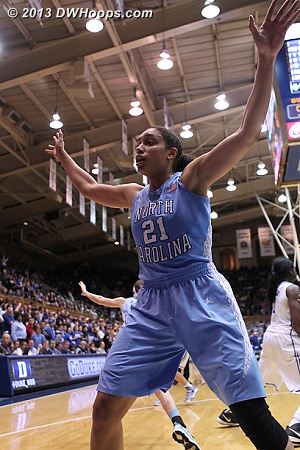 The impressive wingspan of Krista Gross, who wears her emotions on her sleeve and is thus always a great photo subject. 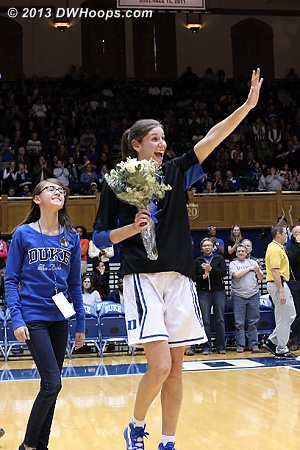 Allison Vernerey got several Senior Day curtain calls as she had to keep coming back into the game in the final minute. 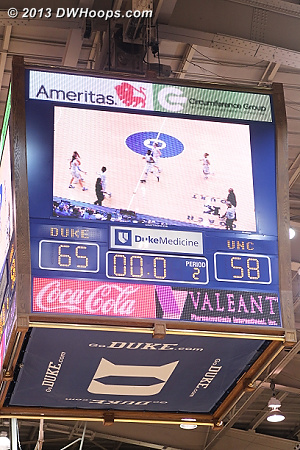 Ballgame - Duke 65, UNC 58. 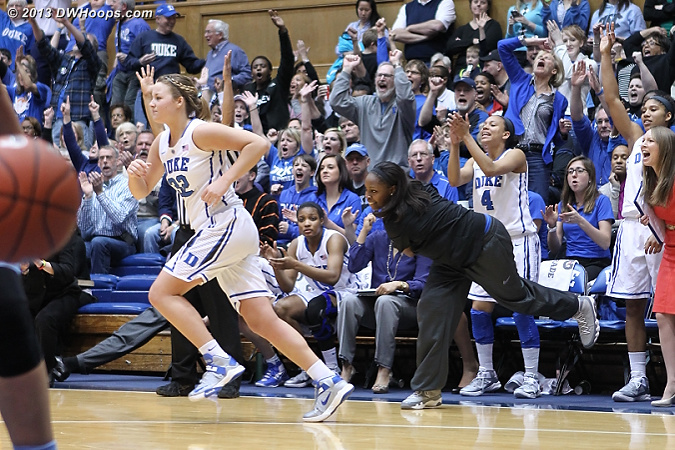 A DWHoops photo gallery of Duke celebrating the 2013 ACC Regular Season Championship will be published separately.